So y’all may have noticed, if y’all were paying Extremely Close Attention, that this is no fashion “blog”. But I do belong to a shopping group or two (wave wave! ), and I’m on some subscribe-o-matics, and wildly unlike in RL I enjoy wandering around malls and exploring out-of-the-way shops, and even shopping. And sometimes I get notices of things. It involves wearing a nicely-scripted and textured HUD, and basically wandering around finding the scavenger-hunt things and the prim-people to click on, in a nice modern build full of baked-in shadows and a fine autumnal atmosphere, in a sort of creepy inbred too-small town from a slasher flick. I eventually actually solved the murder by finding all the millions of things you need to click on (select-by-surrounding doesn’t count as cheating, right? ), and confronted the murderer (after confronting only one non-murderer), and got the Golden Ticket which lets you get all the prizes. And nice prizes they are! But hey, it was fun! Here I am (on the left, lookin’ macho) at one of the few things I did get to; a post-Man-Burn party at the Yokohama Marching Band camp. Woot! Thingmaker news, and another video! That’s a video from the special Burn2 version of the Thingmaker, currently experiencable (experienceable?) only at Ten Thousand Things Camp, my Burn2 build. 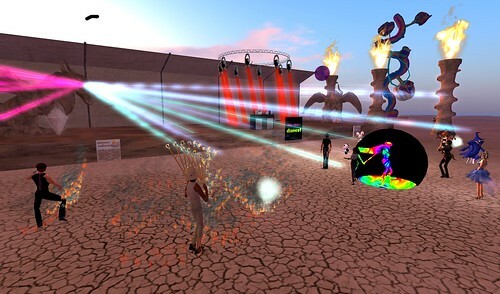 Once Burn2 is over and I find some time somewhere, I will add various of the new features of this version of the Thingmaker to the commercial (“commercial”) version, and update it in my SL Marketplace store, to which I don’t think I’ve ever linked before because of the whole confusingness of XL Street L or whatever it was going away, and stuff being automatically copied over to the SL Marketplace, which at least I can spell. If you buy the Thingmaker in its current version from the SL Marketplace, I will send you the new post-Burn2 version as soon as it comes out. For the fourth in my series of Picks updates, I’m replacing a place that’s not actually gone. But it’s changed quite a bit since I first went there, and so have I, and I haven’t been there for ages, and probably people know about it already. I remember Midnight Reflections as a complicated and mysterious place, all wooden walkways between steep cliffs, tumbling waterfalls, secret grottoes and hidden caverns, misty glowing places with darkness and enigmatic poseballs. When I went back to it for the first time in ages to see if there was any reason to keep it in my Picks, I found a nice-enough sim, still with steep cliffs and waterfalls but somehow without the mystery, and with a big chunk of it now occupied by a remarkably uninteresting store. BEAUTIFUL-PEACEFUL-NATURE-PARKLIKE SETTING with LOTS of WATER FALLS CAVES, Places to EXPLORE alone or with your lover. So has the place changed significantly, or is it just me? Who knows! But anyway, that’s a Pick slot freed up. 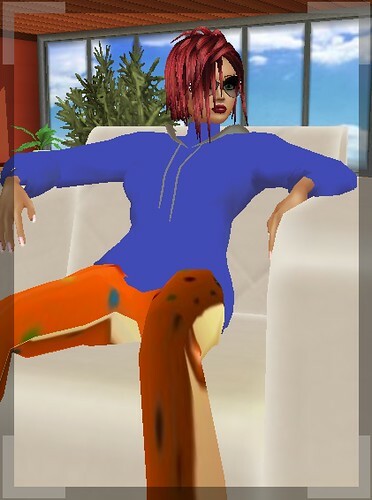 So Second Life is getting “display names”, meaning that although I am Dale Innis, I can have the label over my head say “Dale” or “Catgirl” or “Barak Obama”, or almost anything else I want. This is old news, and I don’t frankly think it will turn out to be all that significant in itself, so I haven’t weblogificated about it (unless I have and I just forgot), but I saw something today that does move me to write. The Lab is saying, and I think correctly, that the Residents will understand enough about immutable identities (the names we have now, which will be called “user names”) versus extremely mutable display names, that there will not be huge amounts of griefing or fraud as a result. On the other hand, the Lab is also saying that you can have any non-offensive Display Name you want, except for ones that end in (or contain, or something) “Linden”. Since we will make it very clear to all Residents that display names are under the control of the user, we don’t expect a significant amount of confusion or fraud using display names. The one exception to this is the name ‘Linden’, which is so tied in current Residents’ minds to LL employees that, although we think the potential for confusion or fraud there is still small, we’ve chosen to forbid it in display names. We regret the limits that this will put on people whose real-life name is ‘Linden’, and we will periodically revisit this limitation going forward. Linden is a real world company with real world brand and protections of that brand. So yes, we will protect that inworld. If the restriction on “Linden” in Display Names was really about protection of real world brands, then presumably they would also be more or less obliged to forbid any other trademarked name as well, which would really cut down on the available space! Or else they’d be blatantly saying “we will protect our own brand, but we will allow our platform to be used to damage any and all other brands”, which would not only show contempt for the brands owned by us Residents, but would be essentially begging for contributory-infringement lawsuits. So given that there are good and bad answers to that question, you’d hope that the Lindens would be giving the good answers, and not giving the bad ones. Unfortunately, this Darkly Cute posting and its comments suggests that the latter bad answer was given at an Office Hours or something recently by Jack Linden, whereas the former good answer was just made up by a humble Resident (me), and posted hypothetically in one or two places in the weblog-o-sphere. I don’t know why the Lab doesn’t have someone assigned to writing down reasonable answers to reasonable questions, and making sure that all customer-facing employees are familiar with those reasonable answers and use them. I don’t know why customer-facing employees are allowed to, or for that matter think that it’s a good idea to, basically pull random answers out of their hats in public. We had that problem with the Adult Exile, and probably with every other major debacle; rather than a nice clear explanation, well thought-out, from the Lab as a whole, we get spur-of-the-moment inventions from individual Lindens. Maybe part of it is the atmosphere of your typical Office Hours or inworld meeting: a room full of random and largely surly Residents shouting questions and accusations and profanities and epithets at one or two Lindens, who do their best to keep their tempers and say reasonable things. It would be trying for anyone. Okay, enough complaining. :) I think I will go build something, or listen to a good DJ. Display Names and bad PR aside, it’s still a wonderful world(s). Per all of the “keep the lifeboats handy” posts about Second Life recently, I’ve been going here and there and seeing if there’s a Dale Innis (or DaleInnis) yet. There wasn’t one in IMVU, but now there is! Well, there sort of is. It actually says “Guest_DaleInnis” above my head, and getting rid of the “Guest” costs US$19.99. I think it is. IMVU has all sortsa little ways like that to coax money out of ya; sort of like the free-to-play Lord of the Rings Online (free mount! for 24 hours; after that you gotta pay). I find the whole “being nickel-and-dimed to death” experience pretty annoying, and I’m glad Second Life doesn’t have lotsa stuff like that.